In his work Buddhism in the Shadow of Brahmanism Johannes Bronkhorst suggests that Brahmanism was able to secure long-term political influence and power in India in the face of other religious-social ideologies at the time because it offered not only useful priestcraft sought after by rulers, but because Brahmins themselves offered both sound political advice and practical social theories. This is why much of the subcontinent came to adopt Sanskrit as a lingua franca. Until that time states and people, including Buddhists, had little reason to use Sanskrit, especially in Greater Magadha. However, when Brahmins gained for themselves influence and power they also introduced Sanskrit as a new medium of official communication which in turn ended up as the language of elites, who were the primary benefactors of religious institutions. Buddhism in India co-existed among plenty of other well developed and stable traditions. When the Buddha walked the earth Magadha was enjoying the fruits of sophisticated civilization following the “second urbanization” of the subcontinent. After the demise of the Indus Valley Civilization (3300-1300 BCE) there was a period of ruralization and eventually nomadic pastoralism led to agriculture and finally to cities once again. In the Buddha's time states were already established and functioning. In later centuries given the lack of political utility afforded by Buddhism it was eclipsed by Brahmanism despite the widespread popularity of the former. This started to change somewhat after the demise of the Gupta empire (550 CE) when Buddhist institutions adopted new strategies to contend with a feudal order, but by then Indian Buddhists had become thoroughly brahmanized. - A lack of a cohesive centralized state in a disorderly multi-tribal society with fringe cultures unwilling to assimilate or accept regal authority. - A landed aristocracy with their own interests often at odds with those of the royal family. - Unorganized native polytheist traditions often connected with political interests at odds with the struggling central state. - A fear of China, which in the Sui-Tang period (589-907) was visibly expansionist, well organized and extremely wealthy. 1. Take refuge in the Buddha, in the Dharma (law), in the Sangha (monks). 5. Respect the aged and the noble. 6. Get rid of selfishness in friendly relations. 7. Give assistance to neighbours and the helpless. 8. Rectify the mind without being influenced by gossip. 9. Imitate the behaviour of the superior ones (monks). 10. Go to no extremes in taking food and in personal conduct. 11. Never forget the favours done by others. 12. Use standard measures for outgoing and incoming goods. 13. Harbour no grudge against anybody. 14. Phrase words so as to please others. 15. Pay no attention to the words of women and those of bad company. Interestingly around the same time a figure named Prince Shōtoku 聖徳太子 (572-622), a statesmen credited for establishing a centralized state in what is now Japan, drafted a “Seventeen Article Constitution” 十七條憲法 which likewise shows political interest in Buddhism. As recorded in the Nihon Shoki 日本書紀 (compiled in 720), the constitution was personally drafted by him in 604 under the reign of Empress Suiko 推古天皇 (554-628). Articles two and three are as follows (for a bilingual version of the entire text see here). II. With all our heart, revere the three treasures. The three treasures, consisting of Buddha, the Doctrine, and the Monastic Order, are the final refuge of the four generated beings, and are the supreme objects of worship in all countries. Can any man in any age ever fail to respect these teachings? Few men are utterly devoid of goodness, and men can be taught to follow the teachings. Unless they take refuge in the three treasures, there is no way of rectifying their misdeeds. They had no letters and just carved wood or tied ropes together. They venerate the Buddhadharma. It was in Paekche [Korea] that they sought and obtained the Buddhist sūtras, which is when they first came to have letters. Prince Shōtoku's constitution articles are directed at ministers and members of the state while Songstän Gampo's are a common set of ethical standards for common men, though both emphasize harmony and cooperation. Both the Japanese and Tibetan states were successfully established only after contending with many inter-tribal conflicts, which consequently led both to emphasize harmony and community. As noted above, “Buddhism provided a unifying socio-cultural model that was promoted by Yarlung dynasty kings for political purposes.” How much was this also true in Japan? Addressing the Buddha I the emperor, servant to the Triple Gem and serving it, do hereby issue a proposal before the great presence of the image of Vairocana Buddha. Here 天皇羅我 is the native Japanese すめらぎ (an alternative kun-yomi reading for 天皇) with 我 functioning phonetically as a genitive particle. Shimode suggests two aspects of a common view about Buddhism in this period. Firstly, Buddhism was an overwhelming alien force that came to dominate much of the culture. Secondly, it is widely believed that Buddhism was received unconditionally, especially by the aristocratic elites. Shimode takes issue with the latter point. He indicates that Buddhism was formally introduced to Japan in the sixth century from the Paekche court for strictly political reasons. It became a component of the Ritsuryō state apparatus whereby Buddhism was regarded as a means of preserving and protecting the country (see an earlier post Buddhist Sorcery and Astrology in East Asia for an outline of the key texts on this matter). There was already a precedent for this in China where in the north Buddhism had been used an ideological support for regal authority and furthermore seen as useful for its more mundane sorcery and material culture.6 According to Shimode, it was not until such figures as Saichō 最澄 (767–822) and Kūkai 空海 (774–835) that genuine spirituality was to be the primary motivating factor in Japanese Buddhism. It was on this day that the emperor heard [this prophecy of the Buddhadharma going east] and was overjoyed. He addressed the emissaries, “I have never heard of such a profound teaching as this, but I will not decide myself.” He then enquired about this to his ministers and said, “The western realm has offered us the Buddha, most sublime in appearance, of which we have never had. Do we venerate him?” The great minister of the Soga clan Iname Sukune said, “The countries of the western realms all venerate him. How could abundant autumn Japan alone turn its back on this?” Mononobe Ōmuraji Okoshi and Nakatomi Muraji Kamako together stated, “The sovereign of our country has always made sacrifices to and venerated the hundred and eighty gods (kami) of heaven and earth throughout spring, summer, autumn and winter. Now to change to venerating a foreign god might invoke the wrath of the gods of this country.” The emperor said, “It should be given to the willing man, Iname Sukune, and we shall try worship.” The great ministers all knelt and accepted this, pleased. He [Iname] placed the image in a house in Oharida and diligently cultivated himself in renunciate activities as cause [for liberation] while purifying his house at Mukuhara to make it a temple. Later the country was subject to pestilence from which the people died prematurely. The longer it went on the worse it became. They were unable to remedy it. Mononobe Ōmuraji Okoshi and Nakatomi Muraji Kamako together stated, “In days past you did not require our counsel, which had lead to this plague. Now should you recover things before it is too far there will certainly be blessings. We should promptly cast [the image] away and diligently pursue future fortune.” The emperor said, “As you say!” The officials then abandoned the Buddha image in the Naniwa Canal and then set fire to the temple and burnt it to ashes until nothing remained. Thereupon there was neither wind nor cloud in the sky and suddenly the great palace was aflame. There was yet another suppression of Buddhism in 585 where after the country suffered a pestilence two ministers, who were chiefs of traditional clans, suggested a ban on the religion again. Buddhist images, a hall and pagoda were torched and three nuns flogged. Still the pestilence continued and the emperor permitted Soga no Umako alone to continue practicing Buddhism. Curiously the Gangō-ji Engi 元興寺縁起 reports that it was not the two ministers who instigated the ban as the Nihon Shoki does, but rather it was the Emperor Bidatsu 敏達天皇 (reigned 572-585) who was the chief priest, native and not immigrant, and charged with kami veneration. In 587 the chief ministerial opponent of the Soga clan was killed and then in 592 Emperor Sushun 崇峻天皇 was slain in a court coup. Empress Suiko had the throne in 593 whereupon the Soga clan had firm control of the state and the introduction of Buddhism and Chinese culture could continue without outstanding resistance from opposing elites. The Soga clan were immigrants to the Japan and thus favoured Buddhism more than the natives who were understandably in favor of their agricultural deities (kami). 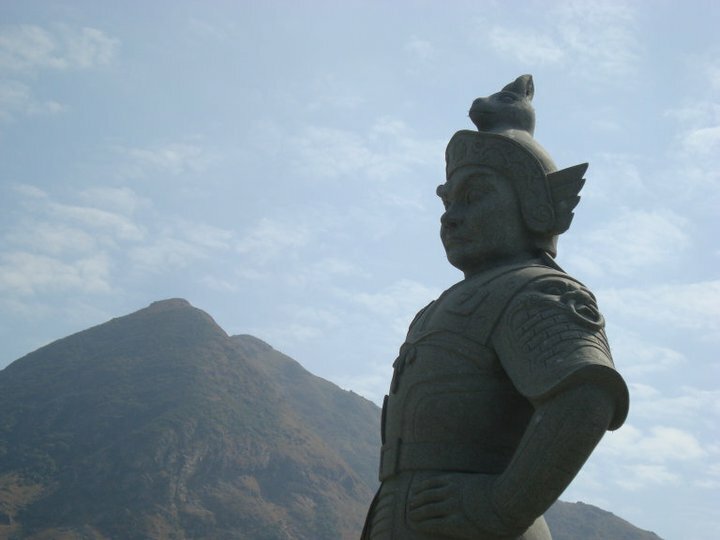 In due time Buddhism became the official religion as endorsed by Prince Shōtoku in his constitution drafted in 604. The highly organized and well developed religion from the mainland brought with it not only supermundane means of preserving the state, but also advanced forms of arts and crafts. More importantly perhaps is that by virtue of the state becoming the primary benefactor of the religion any devotees of it would be less likely to side with forces opposed to the central government and ruling family. Buddhism had some role to play in such a development. Along with foreign technology and arts, there was a decided interest in the early Tibetan empire to raise the state of its culture from barbarism. It was under Songstän Gampo that the first monasteries were constructed which included the Rasa Trulnang (the future Jo-khang) in Lhasa and the Ramoche. The borderland temples for civilizing the frontiers are also traced back to this period. The architecture for early temples developed from ancient fortresses with defensive bulwarks with inward-sloping thick walls and narrow crenelated windows. Despite a degree of Buddhism being introduced, Songstän Gampo's reign was marked by continual violent expansion and conflict. He inherited the throne from his father Namri Löntsen between 625-627. In the days before his father's reign central Tibet had been controlled by a confederacy of clans including the dBas, Myang and mNon. Namri Löntsen had obtained oaths of allegiance from these tribes with which to expand his territories to the north and east of Lhasa and to Kong Po. Later the Dagpo rebelled and had to be reconquered. Following Namri Löntsen's death these problems mounted. The histories differ on what later transpired. ...the paternal subjects rebelled; the maternal subjects revolved. ... The father gNam ri was given poison and died. The son Srong btsan firstly wiped out the families of the rebels and the prisoners. The former would be the earlier history from a time before Buddhism had thoroughly penetrated Tibetan culture. The king is honestly presented as ruthless in crushing a rebellion, while in the latter he is portrayed in much more charitable terms at a time when said king had become a mythic Buddhist figure of the past and revenge killings would not have reflected so positively on him. Nevertheless, by c636 Songstän Gampo was in a position to attack China, or at least subject Chinese governors in frontier Gansu to extortion. During his reign he consolidated his territories, added new ones and received wives as tribute, including the famous Chinese princess married in 641. This is significant because, as the traditional story goes, she brought with her an image of Śākyamuni and sought to have a monastery built. The king was unable to do this and then perceived Tibet to be a "suprine demoness" which was to be pinned down with twelve temples. Scholars rightfully question whether it really happened like this, but assuming such temples were built, some were presumably built on recently conquered territories who did not already host Buddhism. The king conquered and subjugated foreign tribes, which was not at all unlike the Yamato court in Japan which subjugated the Hayato 隼人 and Emishi 蝦夷 peoples early on. 已東吐番國, 純住氷山雪山川谷之間, 以氈帳而居, 無有城墎屋舍. 處所与突厥相似, 隨逐水草. 其王雖在一處, 亦無城, 但依氈帳以爲居業. 土地出, 羊馬猫牛毯褐之類. 衣着毛褐皮裘, 女人亦爾. 土地極寒, 不同餘國. 家常食麨, 少有餠飯.國王百姓等, 惣不識仏法, 無有寺舍. 國人悉皆穿地作坑而臥, 無有床席. 人民極黑, 白者全希. 言音与諸國不同. 多愛喫虱, 爲着毛褐, 甚饒蟣虱. 捉得便抛口裏, 終不棄也. Here we have a contemporary witness reporting what appears to be hearsay, though nevertheless it is significant given that he states there is no Buddhism in Tibet. In this period the Tang empire, which included the satellite kingdom of Silla (the Korean peninsula), had uneasy relations with Tibet and moreover thought ill of its culture. Hyecho's remarks may have been colored by such sentiments, though it is remarkable he notes they have no monasteries. Even if this was just a popular notion in the territories he was traveling through west of Tibet, it does speak about an apparent lack of Buddhist influence in Tibetan culture at the time from an outsider's perspective. In fact there was resistance to Buddhism around this time. In 739 there was a smallpox epidemic. Buddhist monks had been banished from Khotan, Kashgar, Gilgit and Kashmir. They were allowed into Tibet at the urging of the king's Chinese wife, whereupon three or four years later the smallpox epidemic broke out and the anti-Buddhist elites seized their chance to expel the Buddhist monks.12 Again, this is not unlike the Japanese history as quoted above where plague was indirectly associated with the introduction of Buddhadharma into the country, whereupon some elites could seize the opportunity to undermine the new religion. This adoption of course was not universally endorsed. The Buddhist teacher Śāntarakṣita was invited to Tibet, yet there was still much opposition and his visit lasted a mere four months. It is said that at his departure he advised the emperor to invite Padmasambhava, who would be more adept at dealing with the Bon-po. Padmasambhava dealt with the evil spirits, which scholars believe refers to the refractory Bon-po. The construction of Samye Monastery (bSam-yas) proceeded and in due time Śāntarakṣita could return to ordain seven young Tibetan males as probationary monks. Nevertheless the Bon religion still had to be acknowledged, which is demonstrated by the fact that persons from the former Zhang Zhung state were invited to translate their texts into Tibetan. This is not unlike the early conflict in Japan as noted above between kami worshipers and fledgling Buddhists. In the early Japanese state as the power of the imperial court grew they found themselves having to justify their rule in an environment with multiple sources of spiritual authority. So while Buddhism was able to provide an transcultural sanctification of authority, they still had to acknowledge the power that kami worship entailed. The parallels with Tibet on this point are quite remarkable. In Tibet the bTsan-po or emperor enjoyed privileges both as an unquestionable figure in the Bon religion as well as a benefactor of Buddhism. Later emperors who favored Buddhism still observed sacral customs for coronation, in funeral rites and when signing treaties. This is quite similar to the position of mikado 帝 or emperor in Japan where he (or she) was effectively high priest or priestess and expected to fulfill the appropriate rites related to kami worship, yet at the same time could be a devout Buddhist and even declare themselves servant to the Triple Gem as noted above. Chief Buddhist priests at key temples were charged with performing rites which directly benefited the ruler and his family as well as protected him from defeat in battle and other such calamities. Political leaders assigned the Buddhist clergy political responsibilities and ranks within the imperial order for their services. Another striking parallel is that of the position of Vairocana Buddha in Japan and Tibet around the same decades. When Samye Monastery was consecrated in 779 an image of Vairocana was installed as the central image on the second storey with the four-faced Sarvavid Vairocana on the uppermost shrine and an image of Śākyamuni on the lowest storey indicating a nirmaṇakāya or emanation body of Vairocana. Vairocana was apparently associated with the royal cult in Tibet. Curiously an image of Vairocana was consecrated at Tōdai-ji in the Japanese capital of Heijōkyō 平城京 (Nara) in 752. The image is surrounded by nirmaṇakāyas emanating from him. This speaks to the influence and popularity of Vairocana in Asia in this period. The image was built at great expense, but was done so alongside the development of statewide temples administered by priests in the capital, and pressing pleas for people to offer worship to Vairocana three times daily. The Vairocana at Tōdai-ji is probably based on the Brahma Net Sūtra 梵網經 (the scripture appears in fifth century China), though Vairocana also figures prominently in literature directly from India such as the Mahāvairocana Sūtra 大日經 as translated by Śubhakarasiṃha 善無畏 in 724. It is reasonable to assume based on the popularity of Vairocana in Tibet and East Asia that said buddha figured prominently in India as well. Tibet and Japan after becoming strong states continued to invest heavily in Buddhism, though in the case of the former it ended unwell. The nobles and common people ended up revolting, at least in part, at the privileges of the clergy. Some monks were even punished by having their fingers chopped off or their eyes torn out. The imperial court had mistakenly forced unto the people Buddhist virtues which they were not willing to favor ahead of their ancestral code of ethics. The Bon-po nobility took advantage of the situation and murdered the emperor in his chambers. 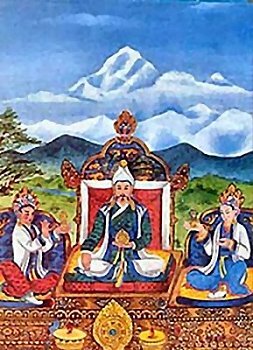 The infamous Lang Darma (gLang-dar-ma) was put on the throne from 838 to 842. Earlier it was Buddhists who had apparently controlled the emperor Ralpacan, though now it was the Bon-po in charge of the throne. The later histories describe a persecution of Buddhism – foreign monks were ejected from the country and translation projects ended. However, this was a period of disorder and chaos as the empire came to an end. Even the Chinese histories report on it. Finally in 842 Lang Drama was assassinated by a Buddhist hermit. Thereafter the Tibetan empire disintegrated, though Buddhism was never lost. Curiously, in 845 under Wuzong 武宗 (814-846) there was a vast purge of Buddhism across the Tang empire. In both Tibet and China Buddhist institutions in the preceding decades had acquired abundant resources and influence, but not without irritating certain circles of power. This did not extend to the Korean peninsula or Japan, however, as Ennin 圓仁 (794-864) the Japanese Tendai monk was received well in both Silla and Japan when he returned. Buddhism in Japan thrived in the ninth century, though the country became isolationist owing to the political situation on the mainland. The Tang empire collapsed in 907 and even with the Song Dynasty established in 960 the north was held by the Khitan or Liao Dynasty (907-1125) followed by the Jurchen or Jin Dynasty (1115-1234). Regardless of the political situation on the mainland, Buddhism was well-established in Japan by the late ninth century. Ultimately, however, in the 12th century Japan came to be ruled by military men whose authority was predictably not so much derived from Buddhism. To sum things up, when Tibet and Japan were emerging states around the same time they faced similar difficulties. They were loosely organized confederations on the edges of other much more sophisticated and technologically advanced cultures. Predictably, both sought to emulate their superiors and Buddhism was adopted alongside other forms of culture. Some of the landed aristocracy with their indigenous religions (Bon in Tibet, kami worship or Shintō in Japan) resisted Buddhism, at times even violently, yet as these two emerging empires developed away from clan-based confederacies towards being centralized empire states subjugating refractory peoples, both domestic and foreign, their leaders gained great spiritual authority by becoming primary benefactors of state-organized Buddhist institutions. Other alternatives such as Brahmanism or Daoism in this period (c6th-9th centuries) did not offer as transcultural and readily adaptable a religion as Buddhism did. Finally, it would have been clear that the religion had already aided state consolidation in the great dynasties of China. That Buddhism was used primarily for political purposes early on in Japan and Tibet is recognized by scholars, though at the same time we should not overstate this. There were of course many devoted practitioners and masters who sought to benefit immeasurable sentient beings. Buddhist institutions were able to secure resources and priveleges to carry out their activities only by virtue of having the sanction and trust of courts. Historically it has often been the case that Buddhist traditions cannot thrive without state support, which is ironic given that the Buddha himself was a homeless apolitical mendicant living on donations of food and cloth. Nevertheless, as Buddhism matured and developed, there emerged institutions which managed not only monastics but also money and other resources like land. Organized religion when having anything to do with money and power is inevitably used for worldly ends which benefit both the benefactor and beneficiary. This is a historical truth that always needs to be kept in mind. 1 The History of Tibet Volume I The Early Period: to c. AD 850 The Yarlung Dynasty, edited by Alex McKay (London, UK: RoutledgeCurzon, 2003), 29. 2 See Shih-Yü Yü Li, "Tibetan Folk-Law" in Folk Law: Essays in the Theory and Practice of Lex Non Scripta: Volume I (Madison, Wisconsin: The University of Wisconsin Press, 1994), 513-514. 4 David J. Lu, Japan A Documentary History (Armonk, NY: M. E. Sharpe, 1997), 23-26. 5 Delmer M. Brown, “Introduction” in Cambridge History of Japan Volume I (New York, NY: Cambridge University Press, 1993), 15. 6 Sonoda Kōyū with Delmer M. Brown, "Early Buddha Worship" in Cambridge History of Japan Volume I, 360. 8 The History of Tibet Volume I, 58. 11 For the full translation see volume 10 of the Collected Works of Korean Buddhism (http://www.acmuller.net/kor-bud/collected_works.html), 120-121. 12 The History of Tibet Volume I, 53. 15 Karénina Kollmar-Paulenz, "The Buddhist Way Into Tibet" in Handbook of Oriental Studies Volume 16 The Spread of Buddhism (Leiden, The Netherlands: Brill, 2007), 315. You've cited Bronkhorst's book a few times now and it sounds very interesting. Pity it's not priced for us mere mortals. I liked this post a lot but I don't know that I agree with the characterization of Japan as having a "fear of China" as such. Tibet had the double whammy of being strategically located and having a history of incorporation into Chinese states; Japan had neither and wasn't really on China's radar at all. In fact, it seems to me that Japan wouldn't have had any relations with China worth the name if it hadn't decided to establish them on its own, in order to get closer to the source of the Buddhist and Chinese culture that it had already received via Korean intermediaries. That said, I don't think this affects the main thesis that Buddhism was imported to Japan as part of the Sinoform state apparatus, partly because it served the political elite and partly because it served those doing the importing -- monks! It does seem relevant to me that Japan imported the whole thing as a unified system -- statecraft, writing, Buddhism -- whereas Tibet apparently reinvented each element from scratch, but I don't know enough about Tibetan history to pursue that idea. Incidentally, minor linguistic quibble: manyōgana technically refers only to the kanji used for sound. The passage you quote is in what's known as senmyōtai 宣命体 or senmyōgaki 宣命書, notable because as you point out content words are in kanji while verb endings, particles, etc. are in kana. 天皇羅我 is actually just "sumera ga" -- "sumera" is another word for "emperor", probably the base onto which something was added to make "sumeroki"/"sumeragi"/etc., although this all took place long before writing was imported so the details of the etymology/evolution are not clear IIRC. The spelling 天皇羅 (rather than just "天皇") is used because the "ra" was still understood to be a suffix at that time. Some scholars believe that the affairs on the mainland, in particular Korea, prompted a lot of concern in Japanese leaders to rapidly adopt foreign institutions (not unlike what happened in the Meiji period). We need to consider that China had been meddling in Korea and launching invasions, in particular starting in 598 CE. The Yamato court had also lost terribly at the Battle of Baekgang in support of its Paekche ally. The entire peninsula was conquered in a joint Tang-Silla campaign in that decade. So in the sixth century China itself might not have been the main threat, but just as well Silla was not a close ally. Thanks for the clarification on the manyōgana / senmyōtai! This is definitely beyond my usual field of study! Sure, I can certainly believe uneasiness about developments on the peninsula -- up to and including direct pressure from refugees from unrest. Now that you point it out, I must admit that the Goguryeo-Sui wars are suspiciously close, chronology-wise, to Shotoku Taishi and his 17-article constitution! But the fact that the Battle of Baekgang came as such a shock to the Japanese court (as evidenced by decades afterwards of erecting defenses, etc.) looks to me like proof that THAT was the event that first made them feel threatened, in an existential sense, by China and its allies. And that was more than a century after Buddhism arrived in Japan and decades after even the big Suiko/Shotoku imperial push. This is surely different from the situation in Tibet, which faced Chinese empires directly. But, as I said, I don't think this cripples your comparison of the two early states -- it just complicates it a bit. Matt, we should bear in mind the Yamato court was probably originally from the mainland (specifically Korea), plus many immigrant clans like the Soga were present in Japan early on. For Koreans the vicissitudes and chaos of China proper were apparent and sometimes on the border or closer (in the sixth century the Han Dynasty colonization of Korea would not have been so distant a memory, too). The early Wakoku kings would have been aware of this, though perhaps felt more secure on an island on the edge of the known world.